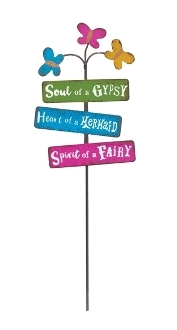 SOUL OF A GYPSY Sign for Gypsy Miniature Fairy Gardens. Full Description: This adorable, trendy sign was designed by artist Genevieve Gail and features hand-painted details. Made of metal; features all-weather paint.